Brittany Bonnici has been one of Collingwood's most consistent players in 2017. With a decorated football resume and an incredibly mature outlook on life, you may be surprised to know Collingwood midfielder Brittany Bonnici is only 20 years of age. Growing up in Victoria, Bonnici first played competitive footy with the under-11s boys at the Wallan Magpies Junior Football Club. If only she’d known back then, when she had to stop playing for her local club at under 14, that one day she’d be wearing the Black and White stripes for Collingwood and living out her dream of playing professional football. In the nine years since, Bonnici has toured New Zealand as the vice-captain of the Australian AFL High Performance Academy, captained Victoria Metro Youth Girls to a national carnival title in 2015, was awarded a hat-trick of Youth Girls All-Australian selections, played for Melbourne in the 2015 exhibition match as an 18-year-old (drafted with No. 2) and has played every AFLW game for Collingwood in her debut season. Did we mention she’s only 20-years-old? Despite her impressive football experience, the midfielder didn’t expect to be drafted to the AFLW after playing only two senior women’s games for the St Kilda Sharks at the end of the 2016 season. “I took a break last year and only played two games of footy. In 2015, I had a bad run of concussions so I had to take a year off,” Bonnici told Collingwood Media this week. But while most of her friends were travelling, studying and enjoying their post-year 12 break, Bonnici was focused on chasing her dream. “I’ve always wanted to play at the highest level and being drafted to the AFLW was just another goal for me to try and achieve. Bonnici was invited to the draft, along with her mum and dad, while her support crew, including her grandparents, family and friends, all gathered back at their home to watch the draft unfold. FEATURE: The tale of Tesoriero. And when Collingwood selected her with their fourth overall selection, Bonnici says the best part was celebrating with her parents and grandparents, who had spent years driving her around and supporting her while she played footy. “My grandpa is a lifelong Essendon supporter, so he rang me and jokingly said to me that I was asking a lot of him to support Collingwood. Despite the momentous occasion, it was a bittersweet moment for Bonnici as being drafted to the AFL had always been a dream shared by her close friend, Daniel. Sadly, when Brittany was 15-years-old, Daniel passed away in a tragic accident. “Daniel and I had played junior football together. I have a screenshot on my phone of a conversation him and I once had about me being the first girl to play AFL. But after a year of uncertainty about her football future, Bonnici decided to honour Daniel by playing the game they both loved. And since she first lined up in round one against Carlton, Bonnici hasn’t looked back. The rising midfielder has been one of the most impressive players in Collingwood’s first season; with her ferocious tackling a standout. “At the same time, running is one of my biggest strengths in my game, and that’s why people see me also as an outside mid, as I’m able to get from contest to contest. 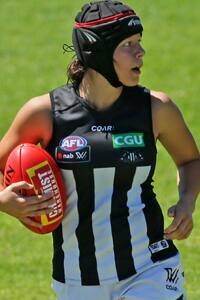 As a junior, Bonnici looked up to former coach and now Collingwood teammate, Alicia Eva. FEATURE: Our AFLW wrecking ball. Another aspect of Eva’s game which Bonnici has been trying to model is her leadership. For Collingwood’s No. 8, captaincy is a future aspiration. “At the moment, I want to develop my leadership more from Steph Chiocci and Eva, but definitely in the future, I do strive to be a key leader of this team. Outside of footy, Bonnici is studying in her second-year of a social work degree at Victoria University, while also balancing a part-time job as a customer service officer. But it’s the new friendships, facilities and professionalism that has Bonnici loving life at the Holden Centre. “I’m also formed a great bond with Chiocci. I would have never expected it because I was one of the youngest, but that just goes to show the kind of person she is – she’ll chat with everyone and includes us all. “Having the access to elite coaches and facilities has made a massive difference to my game. We get to finally live out our dreams, so I’m trying to make the most of it. In addition to her avid work ethic and a lively personality, you may have noticed another key feature to Bonnici’s game – her helmet. ULTIMATE PREVIEW: Sunday's clash with GWS. On Sunday morning, Bonnici, her helmet and the rest of the squad will be on display as the Magpies get to play at their home ground at the Holden Centre.